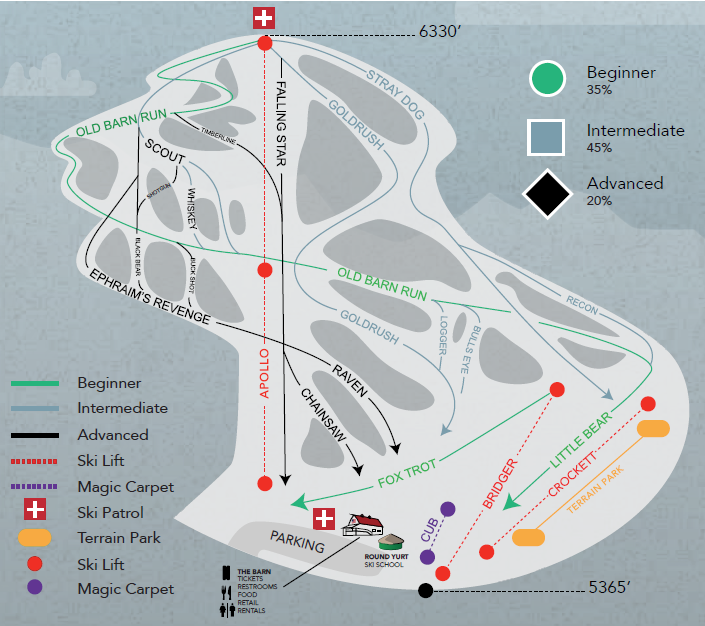 Last season’s Nordic Valley trail map. Still, there are many possible roadblocks. Much of the land needed is in the Uinta-Wasatch-Cache National Forest, which Nordic Valley would need a new special use permit to operate in. Some of the required lands are designated by the USFS as roadless. “It’s going to be a tough road, that’s really all I can say,” Ogden District Ranger Sean Harwood said in an interview with the local paper following the news. “The most important thing is the public’s participation in this — the buy in from the different communities. 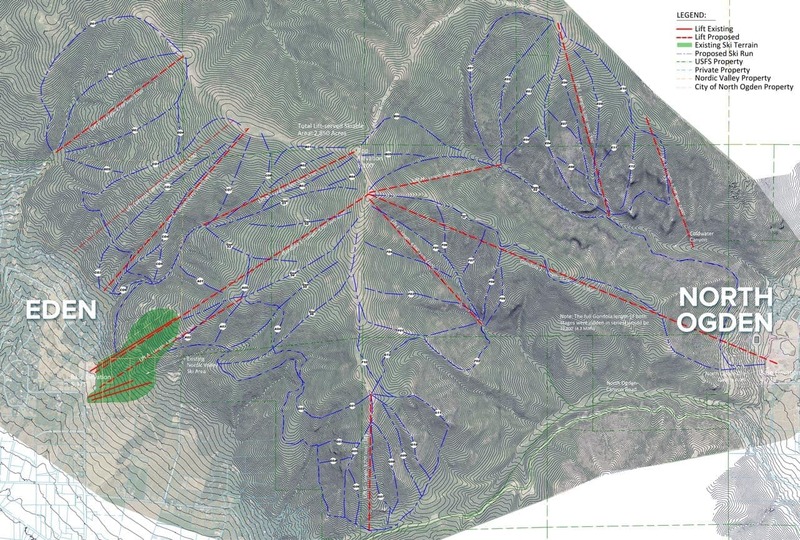 Roadless areas, in a lot of peoples’ minds, is the next thing to wilderness.” The western terminus of the gondola would sit on land currently owned by the City of North Ogden, which has not yet received a formal proposal. If there’s anyone who could navigate his way to approval, it’s Mr. Coleman and his partners, who have spent more than $40 million on improvements including five new lifts in three years at resorts which once struggled to survive at all. The Nordic Valley project website proclaims if the environmental review process is successful, the new gondola could spin as early as December 2020. While a Gondola from Ogden over to Nordic Valley would no doubt help dramatically increase skier visits to NV & Powder Mountain, I for one hope it doesn’t happen. Only because I love the Ogden Valley area (Eden & Liberty) the way it is. My ancestors settled that area. And I love the small country feel. if anything i figured it would be Ogden to Snowbasin. But oh well. Would this be a monocable or 3s? Must be a 3s at that length and with only a 12 minute ride time. I think 12 minutes is North Ogden to the top of the expanded ski area, not the entire length of the gondola. And that first section is about 3,900m long. This means that it would take 13 minutes at the standard 5m/s, and 10 minutes 50 seconds at 6m/s. If you look at it on the website https://nordicvalleyproject.com/ it says how long the lifts will be. You can zoom in on it too. Hey Peter, do you have a link to the full master plan? Just what’s on https://nordicvalleyproject.com so far. They hope to commence the NEPA process in the fall which should yield lots more details. I was thinking that they should invest in some ski areas in the Northwest like 49* North, Bluewood, and White Pass. If they wanted to be bold they could finish that expansion that was planned for Teton Pass, MT (rip). Other potentially more sound places to invest this kind of money are Stagecoach, CO; Tamarack, ID; Saddleback, ME and Jay Peak, VT.
Are Tamarack and Stagecoach really all that sound? They’re kinda infamous to a layman like me as spectacular failures. Unless you’re being sarcastic. I wasn’t being sarcastic. Boise is the single fastest growing metro area in the US at over 3 percent a year. The skiing is excellent at Tamarack and I still see a ton of potential there with all the natural snow they get and major summer traffic at nearby lakes. Tamarack simply came about at the wrong time trying to do too much too quickly. I am not as well versed in the Stagecoach story but it also strikes me as a viable location in terms of population, snow and terrain. What all of the resorts I listed have in common is they are either on private land or are already permitted to operate on public land. Nordic Valley is basically starting from scratch. If ever there was a time to try though, it’s the Trump era. Of course there’s potential at places like Tamarack and Stagecoach for good skiing, but it doesn’t seem like there’s the market. While Boise may be one of the fastest growing urban areas ptoportionally, the low numbers mean that it’s only gaining around 10,000 people a year. That’s only around ~20% of the absolute growth of, say, Denver. The story behind Stagecoach is that it went under during the oil crises of the early 1970s. In bankruptcy, a local real estate agent bough the mountain and simply sat on it for 40 years and did nothing with it. It will be interesting to see what happens to it in the coming years. However, I think it will continue to sit as no recent news has come about the new operator. Two new Doppelmayr HSQs were planned to go in this summer at Stagecoach. Huh. I didn’t know that their collapse was tied to the oil crisis. In truth, I should have been a bit more fair to Stagecoach than I was to Tamarack. It’s in Steamboat, so it really could have been treated as an Aspen/Snowmass kind of thing. If it hadn’t failed when it did, they could have maybe even built Catamount for a third mountain. Hopefully this never happens. Lewis Peak is quiet, a bit of a respite from the noise of the Wasatch Front. I spent two years living a half mile down the street from the proposed western terminus, and believe me, getting out of the noise of that seemingly sleepy suburb is necessary for sanity. Nordic Valley is a cool little joint, but it is too low in elevation for any future low-tide winter, and the North Ogden side is even lower than the Eden side. Really bad idea. The base is already too low in elevation for current climate conditions, often below the snow line, even mid-winter. The proposed summit, at 8K is OK now, but will be marginal in 10 years. It would be waste of money and will be non-viable within a decade. Talk about keeping up with the Joneses.. if u look at some of the facts, the mountain is the smallest of the peaks in the area 8013FT , you have 2 already established and much larger parks down the road who mind you have higher elevation runs. the mountain is part of the Great north western trail system, and a island for animals to pass between the peaks,, the sky line would change and not for the better. More people with both sides already growing, in a low snow year water will become a issue when they need to make snow, with the ski resort expansion comes its rules, more bike traffic, no more horse or dirt bike, and hunting will probably become a odd thing. I could make a list as long as the trails on that mountain :P but reality is it needs to stay wild. This would be amazing. Hope it happens soon so we can ski this area and avoid traffic in the Canyon. Today very few are enjoying this mountain. Tomorrow hopefully more. With the growing community on the Ogden/North Ogden side, this is more than needed. Ski on one side and mountain bike on the other side, at the same time. Great opportunity for the kids of all ages…. It sounds like the proposed gondola would be a 3S rather than monocable. A 3S in that location is the right way to go to minimize the number of towers, but it won’t be cheap. Whistler Blackcomb’s 3S in 2008 was $50 million. WB’s 3S is 2.7miles long. The proposed 3S from Ogden North to Nordic Valley is 4.3 miles long. . On the other hand it may be cheaper to build because there is no huge valley to span over. James Coleman and Mountain Capital Partners must be counting a huge number of tourists / non skiers year round because skiing will never pay for this thing alone. I wonder what he knows about WB’s revenue stream on Peak to Peak. Just saying. Maybe this author could tell the audience specifically, with facts (positive, if any), how the Silver Mountain Gondola was “successful” and what did it “transform”? Ya, it might be have been built – was that the success? Did mother nature suddenly provide more snow to the mountain – was that the success? Those are general, loose, misleading words. To be equally condescending, a business is more successful when more people pay for its services. I’d imaging that Peter is strongly hinting that more people are visiting Silver Star because of the gondola. Thomas, Stev is referring to the Silver Mountain Gondola in Kellogg, Idaho, which I brought up in the above post. SilverStar’s new gondola opens on Saturday up in British Columbia. In the years since the Kellogg community voted by an 87 percent margin to build the record-setting gondola, one of the largest EPA Superfund cleanup sites in the country has been redeveloped into the Silver Mountain Village, a ski resort with five new lifts, a golf course and indoor waterpark. Silver Mountain Resort does 170,000 skier visits, employs 275 people and generates annual revenues of over $20 million. As for the snow issue, Silver was open November 19th through May 13th this year. The year before they closed May 27th. The gondola is now the symbol of Kellogg and I see it as a success even if the profit margin is thin. Silver Mountain was recently sold to a Seattle businessman so at least one other person agrees with me. Well, I feel like an idiot. My apologies. 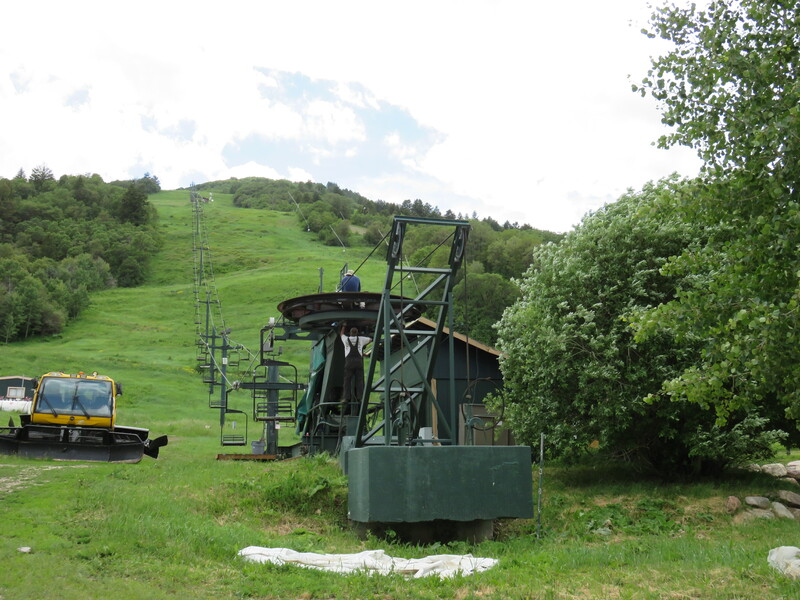 Will the gondola replace the Apollo chairlift? Mr. Coleman spoke with the Salt Lake Tribune about this. Is there a pro gondola group being spearheaded? It seemed like at the meeting this evening at the North Ogden Senior Center the anti No-Gondola naysayers were volatile and seemed to silence a larger part of the attendees who I think may have been pro gondola. Sounds like the public meetings I’ve attended regarding Snow King’s proposed gondola. I went to the meeting at snowcrest and they said that the gondola will have a angle station split into 2 sections like whistlers. Both sides can run independently or can run together. I dont think its gonna be a 3S and I suspect 10 passengers. Both drives at the summit and the returns with tensioning. Im not 100% sure though.